I have changed my ticker now and feeling good about moving forward an extra 24 hours! You all know that I had a scan at 6 weeks at warrington hospital and got heartbeat, well just had scan at liverpools hewitt centre and everything is perfect. The size is 9.4mm smack in the middle of too big or too small and it measures as 7 weeks. Only 5-6 weeks to go until we can relax, oh we are so happy to get this far, , discharged now and hoping to bring the baby up to see them at christmas time. Thats it party time in our house tonight...ahh yawn but I am so tired now. Am sure the next few weeks will drag, they're the longest of my life thats for sure!!!! But it sounds like me that you'll slepp through most of it anyway lol. will do the pictures when my hubbie scans it again, it has my name on it at the top and when he scanned it he did not think that I may post it on the internet, so just waiting till he does it. We sent it to our favourite Aunt cause she has been with us all the way with her love and support and she said it was the bestest of pictures she has ever seen in her life, because of what it is. Kate, this is brilliant news! I am very pleased for you. Keep us updated. Oh, don't forget the picture! Eagerly awaiting. Paris, the pictures are incredible. Very beautiful baby you luck thing. Just a blob but you can make out a shape if you really stare at it forever and use a bit of imagination Nicest blob we have ever seen in our lives. Fantastic news, Kate. That is one snug looking baby! 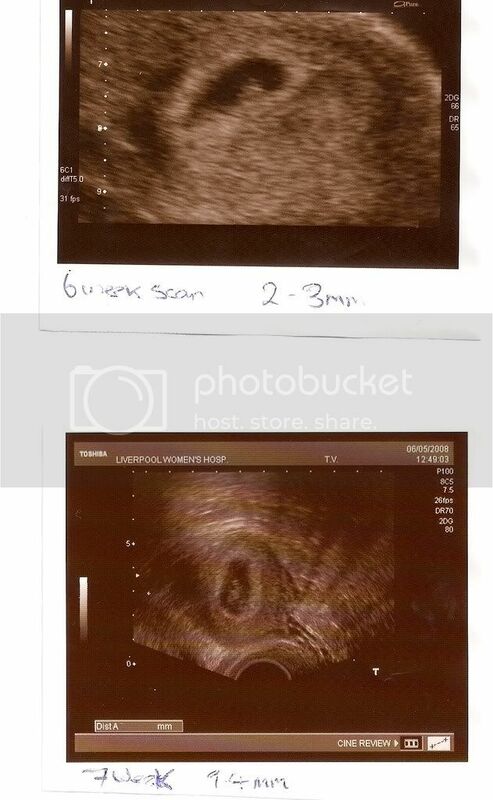 OMG how exciting - you've got a kidney bean (that's what my friend called her baby) - it's amazing what you can see now - it really is there.. wow! Thanks Sarah, yep our henrei is there (if i call it a boy it will be a girl, if I call it kitty it will be a boy), thankgoodness, decided only to get one transferred, thus the singleton. Hoping and crossing our fingers that all is okay, am feeling so sick and tired these days, so hoping that is a sign that all okay, but my sister had nothing with 3 of her 4 beautiful wonderful children. Cant say that I am doing anything but worry about if he is doing okay in there, never been so inactive in my whole entire life, just dont want to do anything. Glad I work from home cause I sleep alot these days and just cant drink enough water and constant trips to the loo. Hope it all stays until its suppossed to, you just never know. Good luck with your scan. Just seen this Paris. The pictures are so clear - they're great! Thats is fab news, its such a relief isnt it? is facing forward on their right side. We were at the hospital for almost 3 hours, as we had the scan then had to see the MW. All seemed ok but we are still going to Leeds next Fri for a private scan. She's moved me forward 4 days so all being well I'm due on 30 November. Awe, what a lovely clear scan photo. Congratulations!